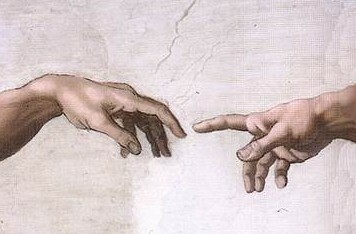 THE IMAGE OF GOD reaching out to Adam with his extended arm and finger, is one of the most recognizable in the world. Perhaps only eclipsed by da Vinci’s Mona Lisa in popularity, the so-called Creation of Adam was painted on the ceiling of the Sistine Chapel by Michelangelo in the early 1500’s. There are a lot of things going on in this painting, but notice the body positions of both God and Adam. It looks like the Almighty is reaching out with all his might to touch his creation, while the creature, Adam, seems laid back and almost disinterested. He is leaning back in the opposite direction, barely lifting his arm and doing as little as possible to make contact with the Supreme. This is no mistake; it was a deliberate and clear decision made by the artist to get his point across. But why? Why can’t an all-powerful God simply reach out and touch the being he made from clay? And why is he trying so hard? One would think that an omnipotent deity could do whatever he wants. But maybe He wants something else, something that requires Adam’s participation as well. A common fallacy is that God has certain ‘chosen people’, those whom he deems worthy of His love and protection. This couldn’t be further from the truth. If the creator god created all that is, including all the human creatures, didn’t he choose every single one of them in the first place? And if He didn’t want any particular ones around anymore, would He not have the power to ‘un-choose’ or destroy them according to His will? God’s ‘chosen people’ are the people who choose God. Perhaps God is more interested in the Free Will that He gave to Adam and all the other humans. For it is true that God’s ‘chosen people’ are the people who choose God. And, if that is the case, then wouldn’t He want people to come to Him, to choose to be connected with the Supreme Being? And if God did all the work, wouldn’t that negate any notion of free will, the freedom to choose? According to the account in the Genesis text, didn’t Eve have the free will to choose to eat from the wrong tree, and Adam to partake, even though God strictly forbid it? There was no Divine Intervention in the Garden; He gave his children the ability to choose freely, to obey or disobey. Therefore, I suggest that the artist was portraying Adam’s own power of free will, the choice of whether or not to reach out and touch God. And it looks like God wants this touch more than anything, but stops short of completing the connection Himself. What good is it if He choses for Adam? If you lift weights for someone, will they get strong? If you practice the piano for someone, will they learn the instrument? No, of course not. Body language aside, a closer look at the two hands reveals even more. Adam (on the left) does not have to lean his body in further, nor does he have to stretch his arm to reach his creator. Literally, all he has to do is simply lift his left index finger up an inch, and contact will be made. This is probably the least amount of effort a person can make, lifting a finger. At this moment that the painting depicts, Adam has not yet done so, but is is abundantly clear that that is all he has to do…if he wants to. So did he? Or, is this painting about us, and our free will, our choice to reach out to God and make the connection? Have we? Have you? And what about all the praying, fasting, scripture studying, incantations and meditations that many religious traditions ‘require’ to win God’s favor? Is any of that really necessary? Could it be that God has unlocked the door already, that He is right there waiting for the least amount of effort on His creation to move toward Him, to consciously choose God? The answer seems clear, at least according to this writer’s opinion and interpretation of a 500 year old painting. But whether you agree or disagree is your choice, and yours alone.